Photos from our March variety show, Pick N Mix, are now online in our Photo Gallery. The Chorlton Players are a non-profit-making theatre group established in 1963. 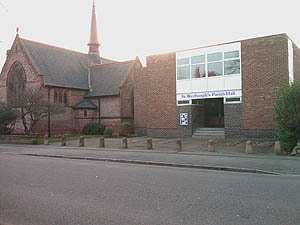 Our group has about forty members, of varying ages, and we produce five productions per season at the Parish Hall on St Werburgh’s Road, Chorlton. We meet every Monday and Wednesday evening for rehearsals and are always keen to see new members. Even if you don’t fancy acting, we are always in need of all the other talents it takes to put productions on: backstage, costumes, front of house, set-building, audio-visuals, make-up, advertising etc. So if you are interested in taking any part in our shows, please get in touch. For more information on our activities, including details of how to get in touch with us, please click here. There’s now a multitude of ways you can receive all the latest news from Chorlton Players. Our e-News service is still going strong with regular bulletins posted to your inbox. To sign up, simply add your details to the Subscription section on this page and click Subscribe. You can unsubscribe at any time. Want the news pushed through to your Facebook account? Then simply click the “Like” option of our Facebook page and everything else will take care of itself. You can easily push the news on to your Facebook friends too. Finally, for those who prefer to receive news via their mobile, you can sign up to our Twitter account here and our Instagram account here.